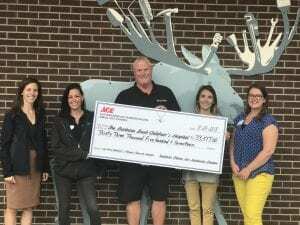 Another record-breaking golf tournament thanks to Ace Hardware – Ace Hardware Corp.
Once again, our friends at Ace Hardware have broken fundraising records! The fourth annual Southern Maine Ace Hardware Dealers Golf Scramble was held August 24th and raised an incredible (drumroll, please!) $33,517 for The Barbara Bush Children’s Hospital (BBCH)! The Maine Hardware team presents another amazing fundraising total! We can’t thank all of the local Ace Hardware stores and staff who support this tournament enough! Over the past four years, their hard work has helped this tournament grow, and raise a grand total of $111,714 for BBCH- our local Children’s Miracle Network Hospital. Thank you, thank you, thank you Ace! We’re already looking forward to next summer’s tournament (save the date: 8/23/19 at Sable Oaks)! Previous post: Miracle Buckets Making Waves!